We all feel like it is time to move on now and again. So, at nearly 71 years old, it is no surprise the man who has led Wimbledon from rebirth to the promised land of Merton is ready to hang up his calculator. “I’ve been promising my wife I’ll spend more time with her for the last 10 years. It’s time to deliver!” says AFC Wimbledon CEO, Erik Samuelson. The recent winner of the 2018 fcbusiness League One CEO of the Year Award has little time for looking back and is now looking forward to finding a successor who can create new stories about this club that has rarely been out of the football headlines during Erik’s tenure. So, as the diggers move in to South West London, Erik’s attention is turning to finding his successor. But it cannot be just any old CEO. 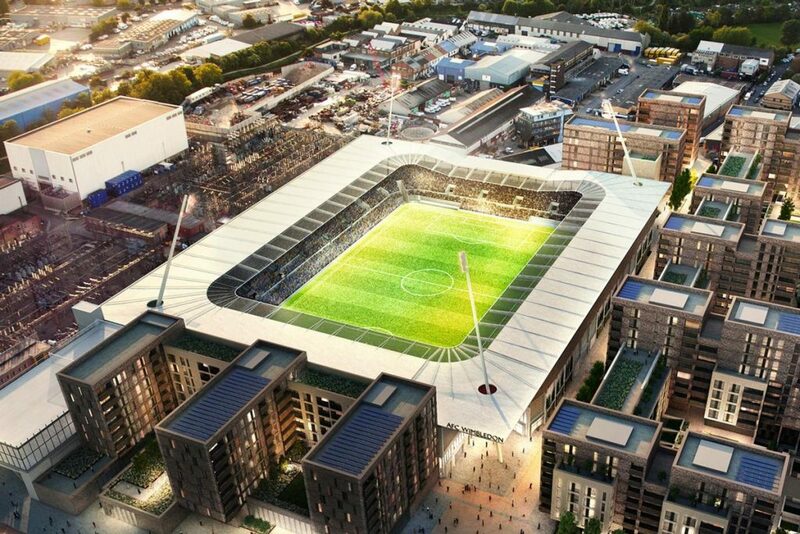 And the thinking for what that stadium will bring to Wimbledon has already begun. As the site managers move in, Erik and his team are now planning what will go into the physical building that will serve the community. So, whilst the ground levellers do their bit, Erik is off speaking to local businesses, parent and toddler groups and other such bodies who need space to meet and do business at some stage. “We’re exploring the space as an education venue; we’re looking at the local conference and meeting space market. I want this place to be busy and vibrant as much as possible and it is making sure we have the flexible space and facilities to deliver that when building starts. It is an obvious business model that has won AFC Wimbledon plaudits and awards and is unlikely to change even after Erik leaves the club. “I know some other fan owned clubs have either returned to accepting external investment after a while or lowered supporter-funded investment, but I cannot see a situation where we would entertain that. Being a supporter-owned business is all we have known. It is how AFC Wimbledon was built and it would be hard to untangle that now. Whilst they have the keys to one stadium, they have now handed the keys over to another. The stadium at Kingsmeadow is now in the hands of Chelsea Football Club after the sale completed over Christmas. The funds from which are now being used to fund that early levelling and development work at Merton. AFC Wimbledon will play there until their new ground is open, but it is also home now to Chelsea’s development and ladies team. “We have left a legacy at Kingsmeadow. We have turned it into a ground that can host Football League games. We updated the West Stand and many other parts of the ground and it is a stadium we have cared for bearing in mind the amount of money we have for these things. “It reminds me of the first house me and my wife bought. We loved it and cherished it, but it wasn’t our forever home. Merton is our real home, but we have loved Kingsmeadow and hand it to Chelsea for them to deliver to their next generation. The handing over of keys at various venues comes at the same time the keys have changed hands in the manager’s office as well, with Neal Ardley becoming only the second manager in a decade that Erik has had to sack. And when the time came for a change, Wally Downes, a man with Wimbledon DNA in him, got the call. So, what next for Erik? Another club role? “I will still come to games when I leave, but I don’t want to be hanging around over the shoulder of the next CEO. They need to be allowed to get on with it.